That is a tank top, and I got tanlines! The littlest things make me happy. 🙂 Thanks so much for your support and enthusiasm these last several weeks, Elodie. Means the world to me! YAY!!!!!!!!!!! Can’t wait to dive in! Also, I’m super jealous of your warm weather. The weather was in the seventies yesterday and I almost broke out the bikini. But now this week we’re back to the fifties. 😦 I need summer, like, yesterday. Congrats again, lady! And go celebrate! You’ve earned it! Well done, Katy!! I hope you get some awesome helpful and encouraging feedback from your CPs. Thanks so much, Colin. And I’m with you — I appreciate all the sunshine I can get, but I’d love to have some consistently nice weather. Come on, Spring! Wow! What a great achievement. I’m with you regarding accountability. It does wonders for me. Congrats on all your success. Can’t wait to see it go the next step. Total parallel lives — too funny! I hope WA isn’t giving you much grief. Beautiful summers, but those rainy months… Yikes. I just took a look at your final update, and it looks like you did fabulously, Kristi. Congratulations! I do miss the sunshine but love the temps out here. I don’t miss the Florida humidity or love bugs. I live by a bay and there were Orca’s in there a few weeks ago, that beats gators any day (thought I’ll pass on swimming with either of them and stick to manatees). Me too, Prerna… I can’t wait to see what they have to say. 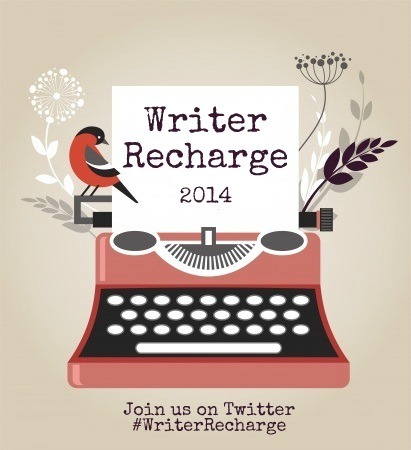 Congrats again on meeting your Writer Recharge goal! I am also a fan of Internet accountability! And finished revisions – go you! Well. we’ve got storms today, so don’t feel too bad. 🙂 Congrats on all of your Writer Recharge success, lady! Congrats, Katy! So, so awesome! Next time I must join in on Writer Recharge! So glad you finished! I am sure your CPs will love it, help improve it, and give you wonderful perspectives to work from. I’m with Tracey, we need a year long hashtag! Also–I’m jealous of your sunny days. We had a snow day at work today because the roads are covered in ice. Aww, thanks so much, Valia! It’s been so fun following along with your progress over the last month. Congrats on all you’ve accomplished! Great accomplishment to get your WIP ready for readers! How did you find your critique partners? I have a few but I’m always curious where writers find theirs. Thanks, Stephanie! As far as my CPs, I found my very first CPs though YALitChat. They’re awesome, but we’ve all sort of found different niches in the industry and moved on to different things. My two most counted on CPs I met through my blog/their blogs, and Twitter a few years ago. We’ve since formed super close email/text relationships and I trust them implicitly with my writing, and I feel so lucky to be able to read and offer feedback on theirs. I also have several people who I trade beta reads with. I’ve met them all through my blog/their blogs and Twitter as well. The Internet is an amazing place for connecting! CONGRATULATIONS! What a huge accomplishment for you! I can’t wait to hear how feedback and revisions go. And I love that laptop reflection selfie. That’s the best. Thanks for co-hosting and being such a great cheerleader! This was a blast! Thanks so much, Sara! I had such an amazing month revising with you all. Thank you again for including me. Let’s definitely do it all over again one of these days!